This tutorial, for PHP developers, will provide you with an introduction to ASP.NET using the C# language. If you've wondered what ASP.NET is about, this tutorial will strive to answer at least some of your questions. Even if you're an ardent open-source fan, ASP.NET contains some techniques and features that are useful to know about. And, as some might say, it's good to know your enemy! ASP.NET is no longer a Microsoft-only technology. Thanks to the hard work of the Mono project contributors, ASP.NET can be used on Linux and Mac platforms, as well as Windows. They've even created an IDE within which you can write your web and desktop applications. Download a copy of MonoDevelop and install it. We'll be using that IDE for this tutorial, as it offers some useful features to speed up development time. However, just like PHP, ASP.NET applications can be written in nothing more complex than a text editor. ASP.NET is Microsoft's web development technology framework, and was originally designed as a replacement for the old Active Server Pages technology. If you've used classic ASP (normally using VBScript) you'll find parts of ASP.NET very familiar. ASP.NET can be used with a wide range of programming languages, including VB.NET (the new version of Visual Basic), J# and C#. This tutorial will be using C#. As this tutorial is aimed at PHP developers, who a lot of the time prefer to get "closer to the metal," I won't be using either of these. Instead, I'll be rolling my own application based on the features of the .NET runtime and C# languages, with ASP.NET as a wrapper, rather than a framework as it was intended to be. Don't worry if that doesn't make sense, just continue with the tutorial and you'll see what I mean. I'm also running MonoDevelop in Xubuntu Linux, but it should work the same on other platforms. Important: ASP.NET is very much built on object-oriented programming (OOP). If you have no experience with OOP I strongly suggest you read this introduction to OOP in PHP. You'll need to understand words like "class", "instance", "method", "property" and "inherit". C# can confuse PHP developers, especially if you switch between the two languages on a regular basis. Here's my top five gotchas. In C# string concatenation is done with "+" rather than ".". Watch out for the scope of methods and properties. The three important keywords are "public", "protected" and "private". These work the same as they do in PHP. Choose "Start a New Solution" in the main screen. A "solution" is a collection of one or more related projects. They can be projects of different types, for example a web application and a desktop application that works with it, and perhaps a web service as well. Select C# ASP.NET Web Application, type a name for your application (I'm using "WebApplication1") and choose a location for your solution then click "Forward". Ignoring the options on the next page, click "OK" and a new ASP.NET application will be created at the location you specified. You'll see it's mostly standard HTML, with a few extra bits. There's already a <form> element with a strange <asp:Button> element inside it. Let's try running the application. MonoDevelop can run your ASP.NET application with one button. Rather than having to set up a local development server and configure your app, simple press F5. A development server will be launched on a non-standard port and you'll see your application open in a browser. Note port 8080 in the URLs below. Note: In Xubuntu I had to manually install the Mono web server named XSP2 with this command: sudo apt-get install mono-xsp2. So, press F5 to run the application, you'll hopefully see a browser window open that looks like this. Clicking the button shows this. What you've just done is clicked an ASP.NET button, which automatically wires-up events to server-side code. In other words, when the button is clicked the page knows about it - this is one of the main advantages of the WebForms framework, it works much like desktop application development. But we're not going to use this feature as it leads to a world of pain (which is explained in Part 2 of this tutorial). Instead we're going to do things a little more manually. It's the PHP way. On the left hand side of the IDE there are three views of the application. The first view is Classes, and shows the class diagram of the application. The second view is Solution, and shows the projects and files which comprise the entire solution (you can have multiple projects in a solution). And there's also a Files view which shows you all the directories and files in the solution, including the "WebApplication1.csproj" file which is the C# project file for our application. Choose the Solution view. You've already got "Default.aspx" open, which is the page you've just edited. Double-click the file called "Default.aspx.cs" to open it in the IDE. Here's the first important lesson. Which is pretty complicated. I mean, homonym? I see namespaces as virtual directories for classes. Just as in a file system you can't have two files called "test.txt" in the same folder, you can't have two classes with the same name in a single namespace. Namespaces can be nested, just like directories (hence the System, System.Web, System.Web.UI references in the code above) and have to be referenced from your ASP.NET code-behind files so you can use the classes contained in them. You'll also have noticed that our application is in the namespace WebApplication1, which means any code we write is within that namespace. We'll use that to our advantage later on. This can be hard to get your head round to start with, but by the time you've created a few pages it will be second nature. Check the source of the page. You'll see the runat="server" attribute has gone. What just happened? We turned an HTML control into a server-side control, that's what. Now in our code-behind file ("Default.aspx.cs") we could access the control and change its properties. Notice I've manually added the visible="false" for the loggedin element. When used with this server-side code we can make each <div> control visible or invisible. You can imagine how easy that makes configuration of pages, and how much cleaner your code can be. Intellisense will even give you a list of controls it finds, so you don't even need to remember what you called all those different text boxes. As we're using normal HTML controls converted to be server-side (rather than true ASP.NET controls) we lose some functionality, but nothing we can't live without. In Part 2 of the tutorial we'll be using a true ASP.NET control. But first, a word about configuration. In your PHP applications you have not doubt had a configuration file named "config.php" or similar. ASP.NET has a special file type for configuration files called ".config" which are automatically disabled from public view. Your ASP.NET application already has a "Web.config" file, open it from the Solution view in MonoDevelop. As you'll appreciate, this gives you a huge amount of power over site-wide settings. You can't get very far developing web applications without dealing with Sessions, Cookies and Post or Get parameters. ASP.NET handles these pretty well, with a couple of gotchas. To get the session ID use: Session.SessionID. Warning: if you don't store anything in the session the SessionID property *may* change on every page request. Yes, I know, it's madness. The fix is to store something in the session. To store something in the session use: Session["var"] = "value";. To retrieve something from the session use: string value = Session["var"];. To store something in a cookie use: Response.Cookies["name"].Value = "value";. To retrieve something from a cookie use: string value = Request.Cookies["name"].Value;. In that last example you got your first look at the DateTime class. This, in a word, is fantastic. Although it lacks the "numbery-ness" of PHPs time() function, it provides a massive array of chainable methods to create and modify datetimes. This is a good introductory article. For a full list of Request.ServerVariables this is a good resource. Getting back to the point; to retrieve something from a post parameter (submitted by a form) use: string value = Request.Form["param"];. And to retrieve something from a get parameter (in the querystring) use: string value = Request.QueryString["param"];. For session variables, cookies, and post and get properties, always check the parameter is not null before trying to access it. This is the equivalent of PHPs isset() function. C# is very unforgiving when it comes to null objects, so in general it always pays to check something exists before trying to use it. Just like PHP, if the first part of the if statement fails the second one is not run. 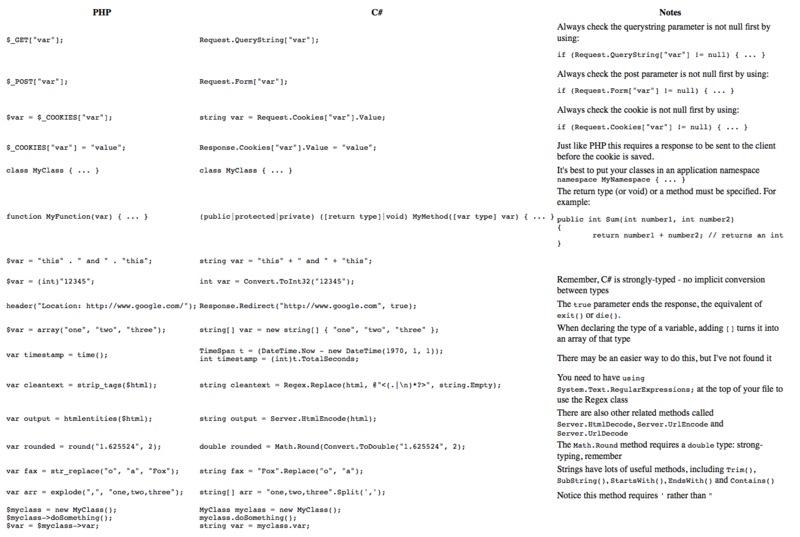 Here's a table of common code snippets in PHP with their equivalents in C#. Custom controls: reuse to the max, baby!